Received 12/12/16, the day of the Goddess Guadalupe, but called to release after 10-10-17, when Jupiter moved into Scorpio for an entire year. Now this message and its powerful intent is possible now. 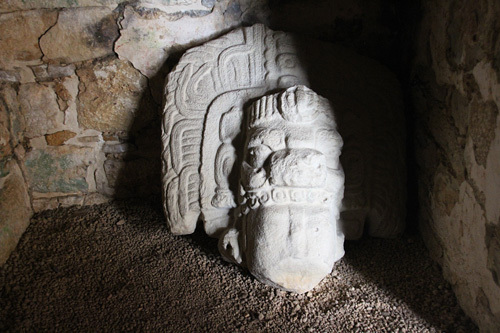 Message was received at the top of a triple temple complex, at the top of the Stairway of Inscriptions in the sacred site of Yaxchillan (The Element of Earth). As we arrived here, three great, ancient grandmothers came and also three giant Peace Eagles flew overhead. This is an auspicious sign. These Grandmothers came to us, and they say that they want to take us back to the very, very beginning where humanity was untouched, untainted, uncontaminated by separation of any kind. They want to invite us (and those reading this) to go deep in our hearts . . . to go back to the time where the only thing that existed was the great ocean. The ocean (the ocean of creation) is nothing and everything, and it still is. It was you, it was me, it was the Earth, and it was everything. They want to take us back to that moment where we were connected to absolutely everything and untainted by any miscreation, because that is where the creative force of the universe is. This is what they intended us to create from when we came here a long time ago. Now we are being asked to remember this pure place. It is already within us. It is just buried under eons of time, ages, wounds, blessings, and all the things that have happened to us throughout history. They want to go back to that pure moment where we were still ONE with everything and with the creative force of the Universe. These Grandmothers want us to remember how to use the creative force of the Universe again in its pure form. This is the great Divine Mother. It is the great ocean, and it is weaving of the water rainbow. This is a pure force of nature. 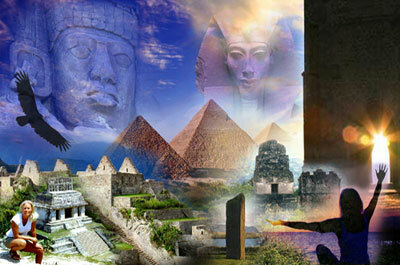 The Old ones, the Maya, knew about this power, and they used it. It is how they created this civilization until many miscreations sailed across the sea and collapsed this purity. They are asking you now (and those reading this) if would like to invite this pure powerful force of nature back into your heart. This is not unlike the power of Christ Consciousness, but just defined differently. Imagine this as a drop of pure water that looks like a light blue diamond. Put this diamond in your heart, and let it expand. This diamond is a drop of pure creative force of the universe. It will begin to wash away all the things in your lives and past lives, making clear space so that you will be able to access this pure source of universal power. This is not foreign to you, your spirit or your soul. You knew, understood and created from this place a long time ago. It will be like riding a bike. You don't forget this energy. You even used this power and light before you came into this body. Now the grandmothers are honoring us (and yes, YOU who are reading this now). They are sending so much love and compassion for us, because we were willing to take on a human form. They honor us, because, with this human form, we also took on all the karma of our ancestors. This is what we have been working really hard to clear. This is the clearing of the Great Ocean, and it is the one and the same as the work that is embedded in Christ Consciousness. No miscreation can survive this light, this power, and this holy baptism of the great ocean. They honor the fact that we were willing to drop away from our pure source and dive into the trenches of humanity. We had to make our energies so dense and heavy, to bring our energy down, so we could actually become human again in this polarizing time. This is why a lot of us never feel quite at peace, or know what we are here to do, because this is not the world we created or the world that we signed up for. But it will be with our courage and light warrior-ship. We did not come here to be in a human body. It has always been about us bringing back to the creative force of the universe again. We have had to reincarnate and come through the bodies of our ancestors, so we can absorb all the miscreations and transgressions, and then bring all that energy back to the source of all that is which is the great ocean of creation. Is that making sense to you, and you are feeling this now? So the Ancient Grandmothers have placed a diamond drop of pure source of the great Ocean inside your heart as a gift, honoring, and an activation. ("Grandmothers" has nothing to do with gender. The creative force always shows up as a female entity, because females can give birth.) This is the beginning to elevating yourself. This is going to help you change the definition of yourself into the truth. It will erase our limiting labeling. If you can, imagine when you look in the mirror that you don't see yourself as a limited human being with the weight of the ancestors upon you, but as a pure drop of pure potential that could create and manifest anything. This will start this seed of pure potential to grow. Does that make sense? I am sure that you have all had the experience that when you feel really clear and good, you catch a glimpse of yourself in a mirror, and you are a little shocked, because we are not really this incarnation. We are universal beings. We are not human. We are pure source; the core. The very beginning of who we are is the great ocean of creation that is everything and nothing . . . yet contains the potential of everything. From this came everything else . . . the Earth, universes, the directions, the elements, and life. Every one of you and every human being on the planet, no matter who you think they are, came from this ocean. They also have that potential to awaken this light in them. I think they are trying to say that we can drop our judgments of others. There was one other thing they wanted to share about this creative force that is the great ocean. Have you ever stood by an ocean where there are big crashing waves? There is nothing gentle about it. And if you really watch nature, there is nothing gentle about it. There are rain storms, earthquakes, volcanoes, storms, and the changing of seasons. It gets really hot, and then it gets really cold. There is nothing gentle about nature. It is an ever changing power, and this power is all within you. Yet the power that we see in nature is many steps away from the pure, great ocean of creation that they want you to become. We are still going to be this human being in this time, but we are going to elevate the pure potential of the great force of the universe within us (and YOU still reading this). This is what it is like to be a living master and awaken your Christ consciousness. Does that make sense? So now, when you feel the power rising up within you, don't hold back. When you feel like there is something that needs to be expressed through you, let it come out. We are in the furthest reaches of the universe, the wild frontier, which is as far away as you can get from this pure great ocean of creation. We are beginning the long journey back home. We have fallen all the way from this great ocean, all the way through the universe and stars, and through your ancestors, and have gotten to this point now to be of great service and torch holders to light the return path. They honor you in ways you cannot imagine. We are so brave, and we don't realize it. So now the Grandmothers are sealing all these gifts inside of you now (you must give permission for this to take place). The grandmothers are asking for an invitation to be with you whenever you call on them. They are asking that they be allowed to walk with you, and anytime that you feel like you need to call on this power to create anything. You can call on this sacred trinity of great ocean of creation, and ask it to help assist you and to be clear about how you put this energy to use in this material world. They will help you remember on a soul and DNA level. These Grandmothers are a very ancient trinity, much like the three Marys, the holy trinity, etc. The number 3 is where Spirit resides. Now they are sending out this beautiful message and droplets of diamond-looking light out to all the searching hearts across the planet, all our brothers and sisters, all the ones that never had the opportunity to come here, all the ones that are in service in so many amazing ways, all the ones that have the eyes to see, the ears to hear, the hearts to love, and the bones that know. They are sending these droplets out all over the planet. Just like you saw the diamond drops sparkling in the air here. I would like to take a moment and honor Mother Guadalupe who appeared as an apparition back in the day before the Spanish ever arrived. She was so powerful that she managed to infiltrate the Catholic Church, and she is now a center figure in the Catholic Church in Mexico and all of the South American countries. She had to be pretty powerful to break through that strong structure of the church. I want to thank her and appreciate her for bringing us together in this group. I also want to send thanks and blessings to all the wonderful Mother Guadalupe runners that we have come across, with all the beautiful light in their eyes, and the joy and the love that they have by honoring her. 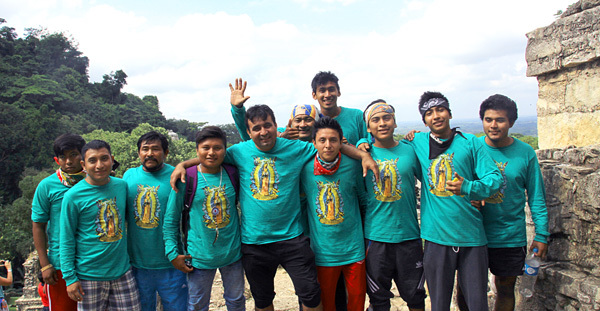 We realize that the Maya runners know that there is more to her than being just a Catholic deity. They know there is an ancient history that courses through their veins, and they are honoring this when they run. I appreciate that so much that they are keeping her essence alive. The Grandmothers want to end with just honoring every one of you (and those reading this) for all the wonderful things that you are doing in the world. You must know that you affect people just by walking by them or saying "hello" . . . the simple things. Just by owning your frequency, everything eventually has to rise up to that frequency. So if you do your base camp work, the rest will follow. When you raise your frequency, everything else eventually has to match it. Archangel Michael pops in and of course cracks a joke here . . . I almost took this out, but he insisted that everyone needed a laugh these days. He is singing the Mission Impossible theme from the movie, and he is saying . . . he has popped in like Tom Cruise on the telephone in Mission Impossible and says "Your mission, if you choose to accept it (laughter) is to take that which you just received and take it out into the world and let it grow and expand and elevate everything you touch." Thanks Archangel Michael. You can destroy my credibility with one joke. LOL. Archangel Michael never feels intimated by the impossible. OK, this why he is using the analogy. The world seems impossible right now. So many of us I know have felt like we have lost, or that we are going backwards. (A woman in our group): I keep hearing a statement from Marianne Williamson "We do not fear that we are inadequate. We fear that we are powerful beyond measure." It is not our darkness that frightens us. It is our light. Well, we are past this now. Everyone in this circle is certainly not afraid of their light anymore (and I hope those also reading this now). It is time to go out there, and shake things up. Just like Jesus shook it up when he threw out the money changers. I don't think it is going to take much effort at this point, because I think things are going to get shook up anyway. Several months ago the Star Elders said the apple cart was going to get upset. They like to use gentle, little analogies that pack a huge punch. They say things in very gentle, kind ways, and then I find out later that it is really intense, because nothing is impossible to them either! The Star Elders always say "You got to tear down the old temple before you can build the new one." So the old temples are getting torn down now. So it is just keeping up with the work and not losing heart. I think this is why they are giving us this activation of that pure creative force; so we won't lose heart and not think that all is lost. You know the saying, "It is always darkest before the dawn". The interesting thing is that we all know that we are standing on the safe spot, because I know everybody here is not nervous about where they are standing. 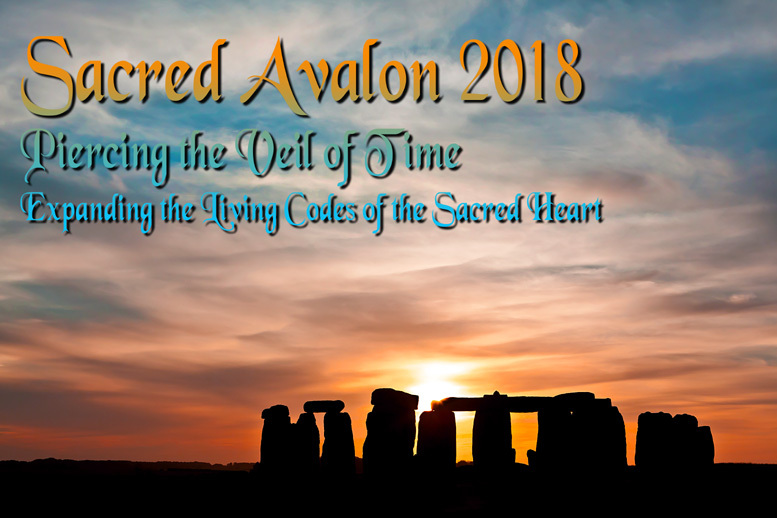 Sacred sites hold a constant energy like an eye of the storm. 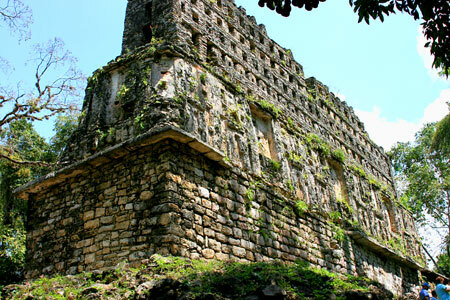 (Our guide Enrique): I remember that in the Yucatan the authorities don't like new age people doing ceremonies. But here, everything is open, because we choose balance. Even the guards saw you coming to do ceremony, and I said "Yes, okay." So go ahead. I think Bonampak has also open to this. So I think this is a sign, a clue, that the sites are going to be put back to proper use again for everybody. This includes those people who just want to be a tourist and take pictures, to someone who wants to do a ceremony. The rest of the message was personal for the group only. We visited inside the temple and had an audience with the living stone inside who shared "It is time. It is time. It is time." So I just thought I would share, because it feels really big what is coming. P.S. As we received this message, the Howler monkeys just howled and howled. Another auspicious sign. When I spoke, they started amplifying the energy, and then they got really raucous, because the message was so big. Their howling also totally helped the group open their hearts for this message. *** Please save me at least 2 days work answering email. Please post, respond or comment on this article on our post on FACEBOOK at https://www.facebook.com/alunajoyyaxkin/posts/1709478819071870 THANK YOU! (If you have a response that is quite personal... please feel free to email me : ) I simply can not answer all your emails... but the fact is that I really want to ;) YOUR comments also benefit everyone else and helps us paint a bigger picture of what is evolving on Earth and Humanity. PLEASE LIKE, COMMENT, and SHARE on our Public Facebook page, because Facebook limits the number of people who can see our updates that they have asked to see. If you want to see more of this, LIKE IT! Copyright Guidelines: Aluna Joy Yaxk'in - www.AlunaJoy.com - Ⓒ 1995-2017 - Unauthorized use and/or duplication of any material on our web site without permission from its author and/or owner is prohibited.